Have you been wondering what I have been up too? How could I write this and just leave you hanging? Well I've got a big, lengthy post all about how the house move went down, but I need to round up pictures and video yet. I wanted to write a quick note to let you know I survived. And yes, the house made the move just fine and is now temporarily sitting next to the basement for two weeks till the movers come back. There's been a lot going on here since then. Water started being trenched in today, electric is coming later this week, drain tile went in around the basement, a ton of dirt work, installing the septic tanks and so much more. While the subcontractors have been doing all that, I have been knee deep in my own projects. 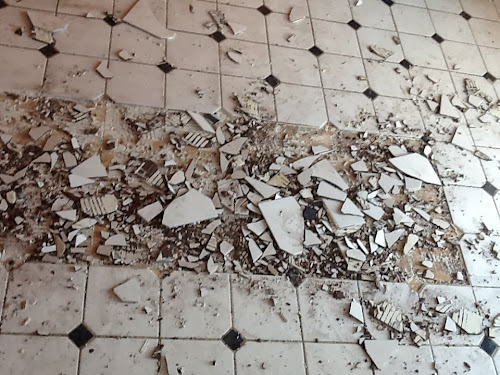 That's the kitchen tile coming out. Lot's of demo to go, but honestly I don't mind at all. I love that I am making progress. I love that I can go to the house anytime I want and do whatever I want with it. I could sit there all day and just swoon. So that's all I have for tonight. I promise to be back soon with all the details on the move and what's next!